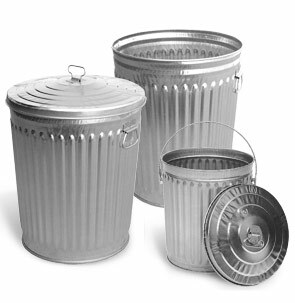 Constructed from galvanized steel, these waste cans and pails will withstand years of use in harsh weather environments. These classic items are finished with a durable zinc coating for corrosion protection. Deep body corrugations for superior strength. Hidden wire reinforcement structures top can edge. Recessed bottom for limited floor contact. Available in Commercial, Medium, & Heavy-Duty Models. 10, 20, 24, & 32 gallon sizes. All Medium-Duty Pail & Lid models are sold in sets of three. Heavy-Duty & Commercial-Duty models are sold and priced as single items.